I was in the mood for something fun and a lil shout to summer since fall is here, but the summer weather is sticking around! 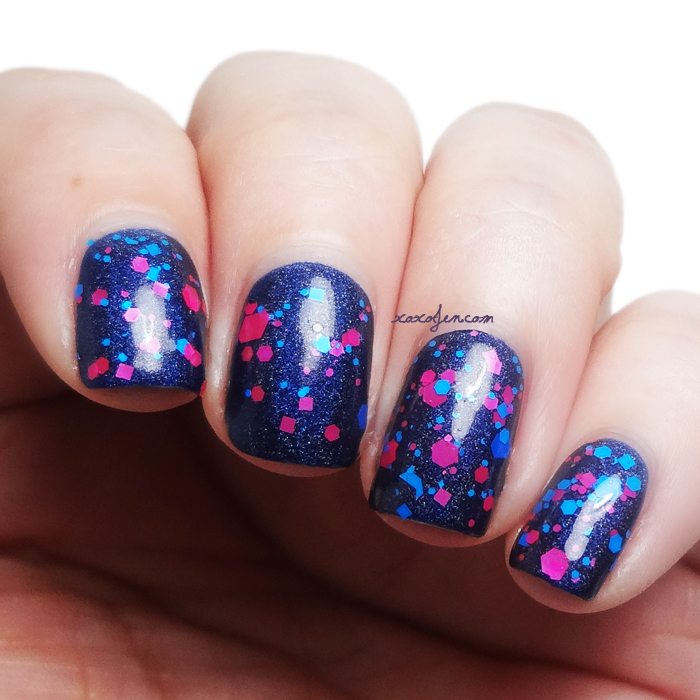 Fer Sure, a neon matte glitter topper from Sweet Heart Polish fit the bill! I am wearing this over a dark denim holo polish, as a "hey fall, I know you're there, but you're behind!" feel. I really like how this turned out, the dark base makes those neon shades simply pop! What do you think of this look? This topper is no longer available for sale, but the Sweet Heart Polish shop has a great selection of other bright toppers to choose from! Really nice combination together! I love neon toppers like this too. I was a little unsure of the pairing before I put them together, thank you for the comment!